San Francisco has the least affordable housing in the United States. The median home now costs over $1.6 million, more than seven times the national level, while the median monthly rent is over $3,700, more than double the national level. These high prices are due to restrictions on building, and especially to San Francisco’s draconian zoning codes, which force low-density development despite high demand. 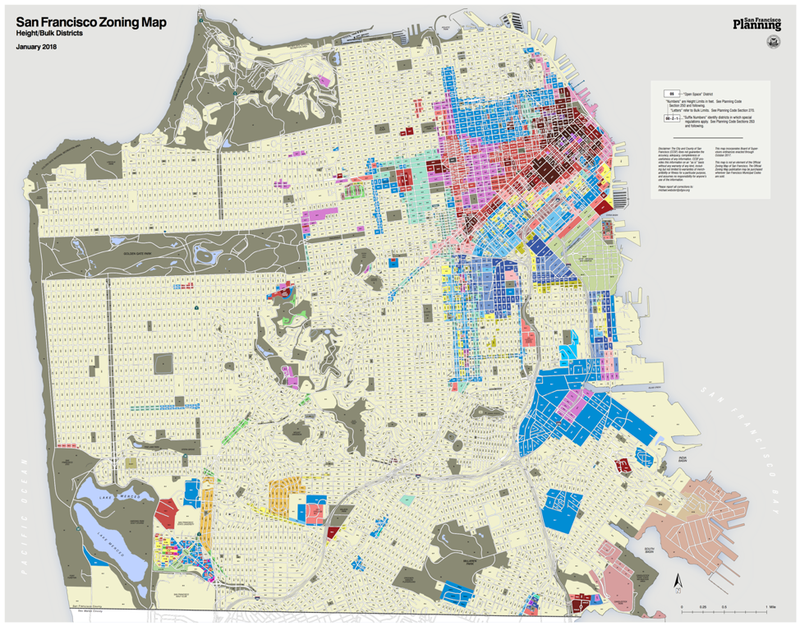 San Francisco’s “general plan,” or zoning map, is almost entirely devoted to preventing development. Due both to local opposition and planners’ preferences for protecting existing neighborhoods, 75% of the available land in San Francisco is zoned for no more than three-unit homes, with the majority dedicated to just two-unit homes. Yet there is increasing pressure in the city to allow more dense housing and development. Over the past two decades, the city government has gradually “upzoned,” or allowed denser building, in a few, select areas of the city, such as South of Market (SoMa) and the upper Mission area. These areas remain the exception. Yet, there are a number of similar areas across the city that can all be upzoned, areas which would have minimal impact on local homeowners, but bring potential benefits to retailers, and vast improvements in housing affordability for all residents of the city. I propose that San Francisco upzone all commercial avenues that are at least three blocks long to allow seven stories, or 85 feet, of dense development, and allow such development to precede “by right,” or automatically, as long as it met the new requirements. This measure should be put to a citywide vote that would allow the entire city, as opposed to just the local neighborhoods and political opposition groups, to have a say in expanding housing. Such a citizen’s initiative would represent a watershed for development in San Francisco, and even in the nation, and would do much to increase the amount of housing in a city desperate for it. 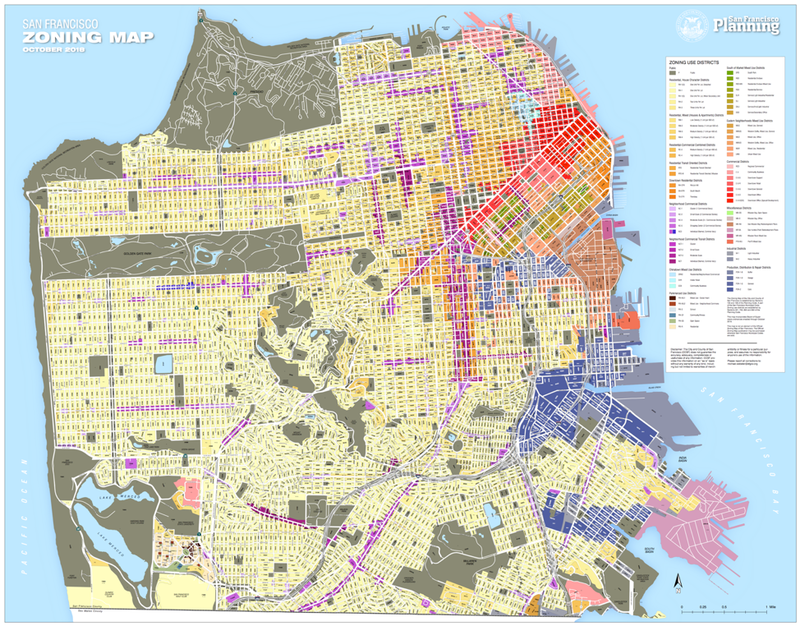 The zoning requirements for San Francisco’s commercial corridors are fiendishly complex. They total hundreds of pages over a dozen different codes for distinct regions of the city. Most commercial zones, however, limit development to no more than 40 feet, which is, at most, four short stories, and more likely three (at about 10 to 13 feet per story). Some commercial districts allow up to 65 feet tall building, but most of those require a “conditional use permit” from the Planning Commission, which requires months or even years of hearings for approval. Many districts require such a permit for any building over 26 feet. Yet a general limitation of six residential stories, with a further story on the bottom for retail, or 85 feet total, could potentially allow thousands of new units across the city. This proposal would remove some burdensome requirements of the current zoning code in commercial corridors, but not all. It would remove the minimum number of bedrooms certain units can have. It would remove all limitations on the number or size of units based on the size of the underlying lot. It would remove restrictions on residential demolitions, and any extra limitations on heights due to abutting alleyways. By contrast, it would retain any restrictions from historic district or building designations, five-foot bonuses for ground floor retail use in some districts, setbacks from the back of the lot of at most 15 feet, as well as generally applicable city laws concerning affordability, and building and fire safety requirements. The “urban design guidelines,” supervised with largely unfettered discretion by the Planning Commission, which require certain architectural designs in many districts, are a more vexing issue, but I believe they should also be removed in commercial corridors. Historic districts, those where new design should most harmonize with existing buildings, will still be subject to protection, and therefore do not need the secondary protection of the design guidelines. In other districts, the guidelines are more often used to stymie any new housing. The removal of these guidelines is certain areas not unprecedented. Current state laws concerning “housing accountability” already forbid discretionary processes for affordable housing in cities that are not meeting their housing goals, including the design guidelines. There are numerous reasons that these commercial streets are ideal for increased development. First, the commercial corridors are already among the most transit accessible in the city, and thus perfect for denser development. 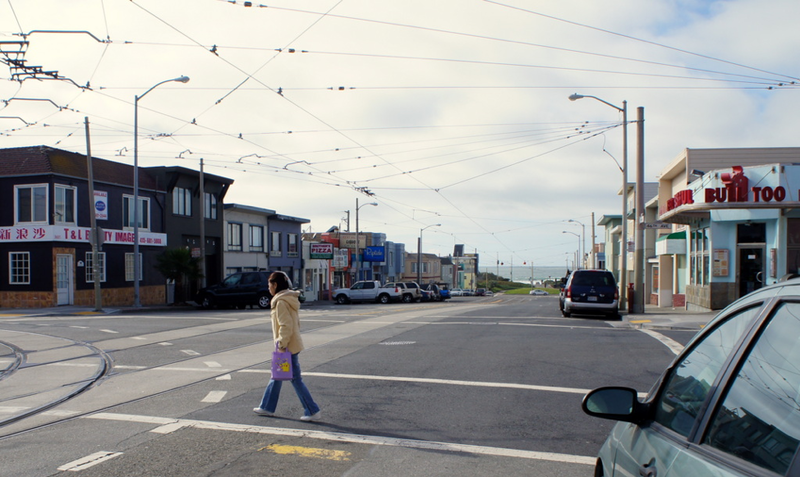 As one study of the corridors pointed out, “In San Francisco, most of the neighborhood commercial streets were initially laid out along street car lines and transportation corridors.” On the West side, the Geary, Judah, and Taraval corridors are all served by Muni Metro Rail or Rapid Bus. Further South, West Portal, Ocean and San Jose, as well as the Southern parts of Mission and San Bruno, all also have Metro rail lines. The Northeast part of the city has little rapid transit, but almost all of it is intensely connected by regular, overlapping bus lines. 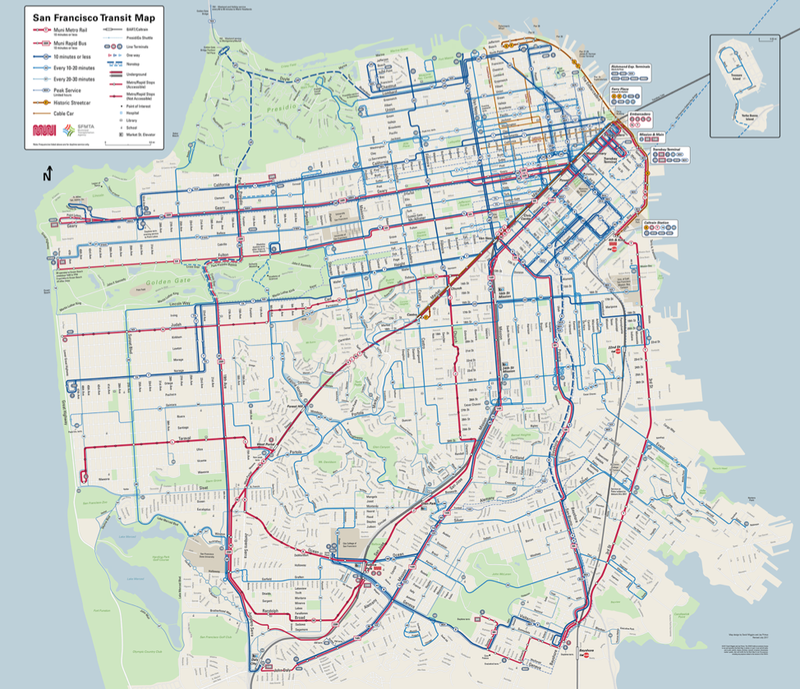 The only commercial districts outside the Northeast not directly served by rapid transit are Noriega and the Haight, where bus lines arrive every ten minutes or less, and 24th Street and Cortland, where they arrive in 10–20 minutes. These are still fairly high-density bus schedules, but of course they can also be upgraded if necessary. Almost all of these districts were also singled out during Mayor Ed Lee’s term as part of his “Invest in Neighborhoods” commercial corridor programs, which provided façade and small business improvement grants to 25 distinct districts. Thus the corridors have already been assisted by the city and are primed for more development. Second, commercial corridors already have the broadest streets in the city. The average street in a commercial corridor is about 100 feet wide (as opposed to less than 60 feet in most neighborhoods), which means not only more accommodation for increased motorized and pedestrian traffic, but less interruption caused by new building to existing traffic, fewer shadows cast on existing homes, and fewer views obstructed. Third, the current mix of land uses in these commercial corridors will make political opposition to new development less likely. These avenues have relatively few housing units today, as well as fewer homeowners and more renters in those units, which will minimize the homeowner opposition that sabotages upzoning in other districts. At the same time, the merchants in these corridors would benefit from the increased foot traffic and development, even if in the short-term more interruptions are possible. If merchant opposition to such a proposal was substantial, it might be possible to mandate, as part of the overall initiative, holding current lease terms for merchants in newly developed buildings constant for up to a decade after building, which would encourage more merchant group buy-in. One objection opponents might raise is that many of these commercial lots already have height limits of up to 65 feet. Many buildings in these commercial districts are also not fully using their current zoning “envelope,” often up to 3 extra, unused stories, especially along streets such as the Mission, according to an analysis of all unused height allowances in San Francisco by an application engineer. Fortunately, the city is already moving to upzone some of these areas. In 2015, much of Divisidero was upzoned to a “Neighborhood Commercial Transit District” (NCT), following other areas such as Ocean Avenue near City College, Diamond Street near San Jose, and parts of Market Street, Valencia, and 24th Street. Due to the moderate increase in Divisidero density, one proposed development increased from 16 to 60 units. This increase can be multiplied by hundreds across the city if the proposed initiative passes, which will go much further than even the NCTs in simplifying permitting and reducing requirements. San Francisco voters have shown numerous times they are in favor of more development, at least when they can vote directly (see Appendix below). Yet when developers or others try to change the zoning laws through the Planning Commission and Board of Supervisors, they encounter fierce resistance from entrenched groups. It’s time to jump past the obstreperous neighborhood groups and take housing directly to the people. A citywide vote on development across commercial districts would be the best means to drastically increase development. It would show the leaders of the city, and even of the country, that people desperately want more building. In the current housing crisis, only broad, citywide measures such as our proposed initiative could make a meaningful dent in affordability. These commercial districts provide by far the best possible place for more housing, since the streets are broad, well-provided for by transit, are minimally developed for housing already, and need more shoppers for the retailers on the ground floors. All of these reasons make an upzoning of commercial corridors an essential step in creating the affordable housing San Franciscans need and deserve. Pundits generally assume that San Francisco voters always oppose densification and increased development, but an examination of all city ballot propositions over the past ten years proves that this isn’t so. Besides the votes on specific development proposals described below, numerous housing bond issues have passed, indicating a consistent desire to increase development. Proposition A in 2015, for instance, secured $310 million of housing bonds, and the city voted to create a housing trust fund with millions of dollars in 2012 (although they had earlier voted it down in 2008). Some other semi-restrictive measures, such as the June 2008 Proposition F, which mandated that the Hunter’s Point development include at least 50% affordable housing, and which would have limited building, were also struck down by popular votes. On the whole, it seems like San Francisco voters in the past decade have voted consistently for more housing. 2008/11 — Proposition G, 62% Yes, 38% No. To “encourage timely development of a mixed-use project in the Bayview on Candlestick Point and Hunters Point Shipyard” and to transfer park land to facilitate the development. 2008/11 — Proposition D, 68% Yes, 32% No. Provide City funds to develop Pier 70. 2014/11 — Proposition F, 73% Yes, 27% No. Complete authorization of Forest City Project on Pier 70, to include 2000 housing units, 2.2 million square feet of commercial and retail space, and increase height limit from 40 to 90 feet. 2015/11 — Proposition K, 74% Yes, 26% No. Expand range of incomes for which city could use surplus property to develop housing, up to 120% of area median. 2015/11 — Proposition I, 57% No, 43% Yes. Mission District Housing Moratorium for 18 months on any project larger than 5 units in the Mission District. It would thus remove “Floor Area Ratio” requirements, basing total floor size on the size of the underlying lot, as well as conditional use permits based on the size of the lot. For those tenant groups concerned about displacement from residential demolition, the initiative could propose that any current tenants would have to be supplied full rental expenses for nearby apartments until the completion of building, at which point the tenants would have a right of first refusal for a new unit in the development. Mark Cohen, “San Francisco’s Neighborhood Commercial Special Use District Ordinance: An Innovative Approach to Commercial Gentrification,” Golden Gate University Law Review 13 (1983): 367, 367–397. “Invest In Neighborhoods” San Francisco Office of Economic and Workforce Development, http://www.sfoewd.org/report/team/neighborhoods/ . Over $2.5 million was handed out in grants to 33 community-based organizations in these districts, and $70 million was invested through special taxes of Community Benefit Districts in 14 areas. Asheem Mamoowla, “Are San Francisco Buildings as Tall as they could be?” Medium, October 23, 2017, https://blog.mapbox.com/are-san-francisco-buildings-as-tall-as-they-could-be-77ecc4a3d32a. Another point some opponents might raise is that any ballot initiative for upzoning will still have to go through the California Environmental Quality Act (CEQA) report process, which will have to be supported by the Board of Supervisors. This is true, but the initiative will show the clear preferences of voters, and force the Board’s hand to begin the CEQA report process immediately. The resulting CEQA report would apply to over 20 areas across the city in one swift action, an unprecedented amount. R.A. Schuetz, “Divis Planning 101: Zoning Changes Explained,” Hoodline, November 4, 2015, https://hoodline.com/2015/11/divis-planning-101-zoning-changes-explained. Interestingly, the basic height limitations did not change, remaining at 40 and 65 feet in different parts of the district, but other requirements were relaxed, and a five-foot bonus allowed in some cases. San Francisco’s Proposition M vote in 1986, which limited downtown skyscraper square footage, attracted extensive national attention, and became a touchstone for the national anti-growth movement. A commercial corridor upzoning vote today could attract similar attention for the opposite goal. See Ricard Edward Deleon, Left Coast City: Progressive Politics in San Francisco, 1975–1991 (Topeka: University Press of Kansas, 1992). Whatever one thinks of the means to secure such housing, it does show that San Francisco voters are not only willing to endure more development, they are willing to tax themselves to get it. Judge is a senior policy analyst for 8VC and the Cicero Institute.